Megan Hilty stars in NBC’s musical drama Smash as the seasoned triple-threat Ivy Lynn, an ensemble performer who has spent years pursuing stardom only to be bumped back into the chorus again and again. Ivy seeks to know whether she has finally earned her place in the spotlight or if she is destined to remain a minor player. Hilty was recently signed to Sony Music in a partnership between Sony Masterworks and Columbia Records. Her new album will be released later this year. Megan was most recently seen as Lorelei Lee, the diamond-loving blonde made famous by Carol Channing, in the Encores! 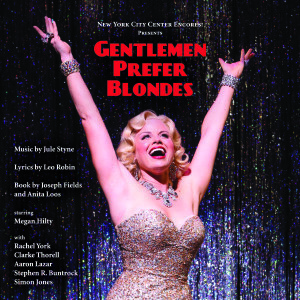 production of Gentlemen Prefer Blondes, which ran from May 9-13 at New York City Center. The production was directed by John Rando with music direction by Rob Berman and choreography by Randy Skinner. Set in the Roaring Twenties, Gentlemen Prefer Blondes follows the madcap adventures of the original “dumb blonde,” Lorelei Lee, as she sets sail for Europe with her best friend Dorothy Shaw. After receiving rave reviews for her portrayal of Doralee Rhodes in Broadway’s 9 to 5: The Musical, Hilty was honored with nominations for Lead Actress in a Musical at the Drama Desk Awards, Outer Critics Circle Awards, the Drama League Awards and L.A. Stage Alliance Ovation Awards. She starred in Two by Two as part of the reprise series in Los Angeles, opposite Jason Alexander, Steve Weber and Faith Prince. Hilty has also performed with the Cincinnati Symphony and at Feinstein’s in New York City. Hilty’s voice has been featured on Disney’s The Secret Life of Magic Gourd, Phineas & Ferb, Glenn Martin DDS, American Dad, Tinker Bell and the Pixie Hollow Games, and Robot & Monster, as well as singing as Snow White in the film Shrek the Third. Her voice will also be heard as Rosetta in Disney’s Tinker Bell: Secret of the Wings. Hilty is currently in production on Summertime Entertainment’s animated film Dorothy of Oz with Kelsey Grammer, Hugh Dancy and Lea Michele. Her television credits include guest-starring roles in Melissa & Joey, Bones, The Closer, Desperate Housewives, CSI, Shark, Ugly Betty, Eli Stone and The Suite Life of Zach & Cody.